Short for Merkevet Giborei Hayil (Hebrew: מרכבת גיבורי חיל‎, literally Chariot of War Heroes). One version states that the real source of the name is the designation M48A3 (in Gematria, 40 is "mem" ("m"), 8 is "chet" ("ch") and 3 is "gimel" ("g")). Like the above, but "g" stands for Germany, a supplier of the first M48 tanks to Israel. Yet another version says that M48A3 can be read as MAgAch (4 looks like "A", 8 like "g" etc.). A once popular macabre joke in the IDF said that "Magach" stands for "Movil Gviyot Charukhot"—"charred bodies carrier", probably referring to the Yom Kippur War losses and particularly to the aforementioned flammable hydraulic fluid problem of the M48. Other variants include "Meshupa Gahon" (one with sloping belly) and even "Mechonat Giluach Hashmalit" (electric shaving machine). Magach 7C in Yad la-Shiryon museum, Latrun. Magach 3: Modernized M48A1/A2C/A3. The modifications included British 105 mm L7 cannon, low profile commander's cupola, upgraded communication suite, a 750 hp diesel engine Continental AVDS-1790-2A with Allison CD-850-6 transmission. They were eventually fitted with Blazer ERA. Magach 5: M48A5 in the original configuration. Generally similar to the Magach 3, but had slightly different engine and transmission—AVDS-1790-2D and CD-850-6A accordingly. They were eventually fitted with Blazer ERA. Magach 6: Modernized M60/M60A1/M60A3. Fitted with the Urdan low profile cupola and Blazer ERA. Magach 6A (6 Alef): Modernized M60A1. All vehicles were eventually upgraded to the Magach 6B level. Magach 6B (6 Bet): Similarly modernized M60A1 RISE (M60A1 with AVDS-1790-2C RISE (Reliability Improved Selected Equipment) engine). Magach 6B Gal (6 Bet Gal): Magach 6B with Gal fire control system. Magach 6B Gal Batash (6 Bet Gal Batash): Magach 6B Gal fitted with 4th generation passive armor and 908 hp engine. The turret has angled sides and angled mantlet. This variant is sometimes unofficially referred to as Magach 7D or Magach 8. A limited number of vehicles were converted from the Magach 6B Gal variant. Magach 6B Baz (6 Bet Baz): Magach 6B fitted with Baz fire control system. A limited number of vehicles were converted from the Magach 6B variant. Magach 6C (6 Gimel): Modernized M60A3. Magach 6R (6 Resh): Modernized M60, with engine upgraded to the AVDS-1790-2AG level (with more powerful electric generator compared to that of AVDS-1790-2A). Magach 6R* (6 Resh*): Magach 6R with preparations for mounting Nachal Oz fire control system. Magach 6M (6 Mem): Magach 6R* fitted with Nachal Oz fire control system. Magach 7A (7 Alef): Fixed flat mantlet with gun "slots". Magach 7B (7 Bet): An interim model with armor configuration similar to the 7C. Apparently never reached production. Magach 7C (7 Gimel): Fixed angled mantlet with gun "slots". Pereh missile carrier: Guided missile artillery variant armed with the Spike missile. Magach should not be confused with the Sabra series of upgrade packages for the M60A1/A3, which were developed for export to Turkey. 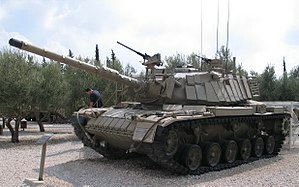 Sabra includes upgrades similar to those of the Magach 7, but an essential difference is that it is armed with the MG251 120 mm smooth-bore gun (the same as used by the Merkava 3). ^ a b "Patton Tanks in Israeli service", Vehicles, Israeli weapons . ^ "Trade register", Arms trade, Sipri . ^ Prigg, Mark (22 July 2015). "Israeli top secret missile launcher disguised as a TANK finally declassified after 30 years of rumors and secret missions". The Daily Mail. Retrieved 24 July 2014. ^ a b c Brezner 2008, pp. 23–25. Brezner, Amiad (December 2008), "בֵּין גְּבוּלוֹת" [Rammed] (PDF), Shiryon (in Hebrew) (30), archived from the original (PDF) on 2010-12-14 .
mass, michael, MAGACH 6B GAL AND GAL BATASH [M60A1 IN IDF SERVICE PAT II] (4) . Wikimedia Commons has media related to Magach tank.